The release of Chrono Trigger: Crimson Echoes, a full-length RPG in development by fans since 2004, has been halted in response to a cease and desist letter sent by Square-Enix. Chrono Trigger: Crimson Echoes, a fan-made Chrono game based on the Chrono Trigger ROM, had been in development since late 2004 and was scheduled for an online release on May 31 this year. 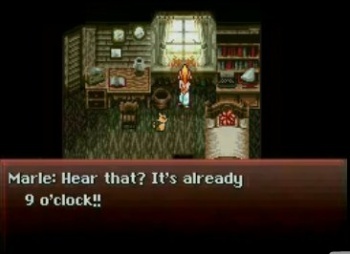 According to its creators, Crimson Echoes boasted 35 hours of gameplay, 10 endings, and 23 chapters. It was, they said, an "unprecedently exhaustive work in the ROM modification community." Why all the "was" talk? All work on Crimson Echoes has been halted and the release canceled in response to a cease and desist letter sent by Chrono copyright holders Square-Enix. What may have seemed like a labor of love to Chrono fans was "an act of copyright infringement" that was "deliberate and willful," a "ROM hack game" that can command up to $150,000 in salutary damages. The Crimson Echoes team immediately complied with Square-Enix's request, canceling and destroying all work on the title, something they had promised to do from the beginning. "Should Square Enix perceive the project as a threat...Kajar Laboratories will immediately cease operation on the project and comply with Square Enix's orders," the readme file to the demo of the game declared. "We thank those fans who followed the game's development, and also those who poured countless hours into the vision of a fun, new Chrono game, made by fans for fans without copyright claim or intent to make profit," developer ZeaLitY wrote. ZeaLitY hopes that Square-Enix's action could be a sign that the company "cares about the franchise and intends to produce future titles, and not merely a shortsighted legal exercise that will further alienate a tired, neglected fan-base." Let's hope so, too.